We would like to give you the opportunity to volunteer at the Bee Family Centennial Farm Museum. We are looking for docents to give tours of one area of the farm (ages 14 +). The farm is divided into three areas; Houses and Transportation, Animals, and Crops and Machinery. We have two homes, a 1894 house and a 1942 house, garage, a milk barn, horse barn, and shop building. A Tour Guide is available with information that covers each area. Opportunities include being in one of the museum buildings during our special events. 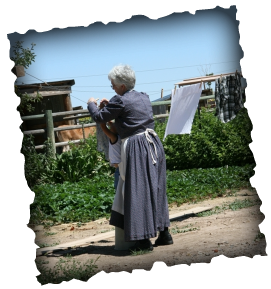 You would answer visitor questions and do simple demonstrations such as quilting or needle work, churning butter, demonstrating hand tools, or explaining the parts of the horse’s harness. There are also opportunities to supervise hands on activities for children such as; washing clothes, gathering eggs, milking a cow, grinding corn, pulling a plow, throwing irrigation tubs, or running a pulley (ages 12 +). We are also looking for volunteers to do yard work and cleaning of the buildings. This could be done on a flexible schedule. Volunteer opportunities for children would include yard and garden work and cleaning animal pens at certain times of the year. We are open on Friday and Saturday from 10:00 to 4:00, May – October, and Tuesday – Thursday by appointment. Volunteers would do either a morning shift from 10:00 to 12:30 or an afternoon shift from 12:30 to 4:00 on Fridays or Saturday and/or be available for other groups and special events if possible. Our 2014 Special Events are Vintage BB game June 14 and Pioneer LD Sept 27. For further information or to volunteer please call 482-9168 or 482-2696.